When one suffers from cancer, they are often subjected to chemotherapy, which helps in destroying the cancer cells that grow rapidly in the body. Chemotherapy drugs are very powerful and may affect other cells too, like the cells in the roots of hair. As a result, you suffer from hair fall. All chemo drugs do not cause hair fall. Whether your hair falls completely or it just becomes thin, depends in the dose of the drug taken. The hair thus caused is not permanent. After the treatment is complete, your hair will grow back in three to ten months. The texture and shade of your hair may change for a time being, but do not get worried about it. Can Hair Loss be avoided during Chemotherapy? There is no guarantee that chemotherapy will not cause loss of hair after treatment. Doctors say that the best way to deal with such problem is to prepare yourself for the consequences and try to be comfortable with the way you look before, during and after the treatment. Much of it depends on how much you care about your appearance and above all, the support of your loved ones as you go through this crucial time. Since hair fall is common with chemotherapy, you have no ways to prevent it. However, there are some ways by which you can manage it. Here are few steps that you can take before, during and after your chemo treatment, which will help you to cope up with the situation and lessen the anxiety and frustration that you experience due to chemo hair loss. Take proper care of your hair and threat hair gently. Do not use any color, bleach or other such products that may weaken your hair. Do not perm your hair and also avoid using hot rollers and curling irons. Let your hair dry naturally. You can cut your hair if you wish. When you have short hair, thinning of hair is less noticeable. By cutting your hair short, the baldness that may occur later will not be as shocking as when you have long hair. Another thing to keep in mind is to think of some options to cover your hair like a scarf, wig, hat or anything that is stylish. This helps in covering the baldness. However, if you do not mind being bald and do not want to cover your head, all the better or it. It is up to you to decide. Continue to treat your hair gently as you start chemo treatment. Use a soft brush and do not wash your hair too often. Make sure that the shampoos you use are gentle on your hair. When your hair starts falling, your scalp will start itching and feel sensitive. You may shave your hair to reduce the itching and irritation. Make sure that you protect your scalp properly whenever you go out, whether it is sunny or cold outside. This is because chemotherapy can make your scalp extra-sensitive. This causes irritation on your scalp when there is extreme heat or cold. After the chemotherapy is complete, you must still be gentle with your scalp and the hair that grows. New hair that grows may be fragile. So, you have to avoid coloring or styling your hair for a while. You must be patient and let your hair grow in its own time. The damage done to your hair by undergoing chemotherapy takes time to repair. So, do not be in a rush to get your hair back. 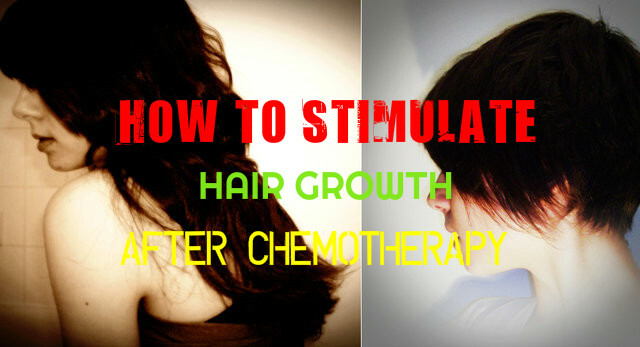 Hair loss as a result of chemotherapy is something that you cannot avoid. But you can take proper care of your hair and make sure that your hair grows back well. Treat your hair gently before, during and after the chemotherapy. Always use gentle products when your hair starts growing after chemo. You can choose shampoos containing niacin to improve blood circulation and salicylic acid to make scalp clean. Do not use shampoos that contain chemicals that are harsh on your skin. Shampoos containing biotin, cysteine and proteins are good. Use Minoxidil before and after the treatment. This helps in the re-growth of hair after chemo. Consume foods rich in proteins like beans, eggs, meat, lentils etc. These help making new hair to grow faster. A well balanced diet helps to promote hair growth after chemo. Vitamins A and B, amino acids and herbs, which are beneficial for healthy growth of hair, are also to be included in your diet. After undergoing chemotherapy, use cool water to wash your hair as hot water can damage the hair follicles. Olive oil is good for hair growth after chemo. Massage olive oil on your scalp and wait for about 30 minutes to 1 hour. This will help in the re-growth of hair. You can try scalp hypothermia when you undergo chemotherapy. Place an ice pack on your hair and for reducing the flow of blood to your scalp. This has worked for majority of people, but in some people it has caused a small risk cancer cells reoccurring in the scalp as it received less amount of chemotherapy dose compared to rest of the body. By consuming foods rich in inositol you can make your hair grow. This is because inositol is beneficial for the regeneration of healthy hair cells. Beans, brown rice, whole-grain bread, liver, nuts, cantaloupe, wheat germ, green leafy vegetables and citrus fruits are rich in inositol. They help in healthy growth of hair cells and provide you healthy hair. You can also have inositol in the form of supplements. Phytic acid is inositol mixed with phosphorous, which is found in cereals. Very useful information shared. Everyone should read this article. Thanks for sharing this informaiton.